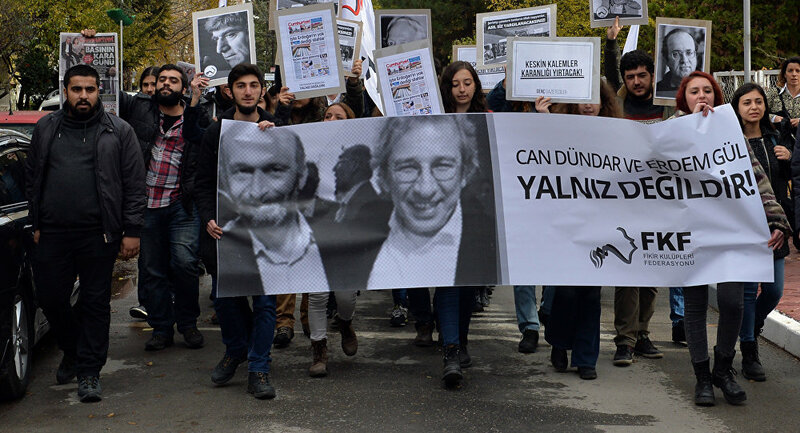 Reporters Without Borders (RSF) and other organisations will issue an international appeal for the release of Can Dundar and Erdem Gul, and the other journalists who are imprisoned. WASHINGTON (Sputnik) — Reporters Without Borders (RSF) along with the Turkish Association of Journalists (TGC) will conduct a special press conference Tuesday on the arrest of the two Turkish prominent journalists, and will issue an international appeal for their release, the rights group announced in a press release. On November 26, Cumhuriyet newspaper editor-in-chief Can Dundar and its Ankara representative Erdem Gul were arrested on charges of espionage and treason after the outlet published a news report with photos of trucks carrying weapons bound for Syria. “RSF secretary-general Christophe Deloire, TGC president Turgay Olcayto, Cumhuriyet's lawyer Bulent Utku, and well-known figures will issue an international appeal for the release of Can Dundar and Erdem Gul, and the other journalists who are imprisoned in Turkey,” the RSF stated on Monday. Other rights organizations will join the appeal and the conference, which will take place at TGC headquarters in Istanbul. Domestic and international press institutions and political figures have condemned the arrest of the Turkish journalists. The controversial article and photos, released by Cumhuriyet in May 2015, claim that Turkish trucks carried artillery shells, machine gun rounds and mortar shells to Syrian opposition forces. Ankara denied the reports, insisting instead that the vehicles were delivering aid to Syrian Turkmens.